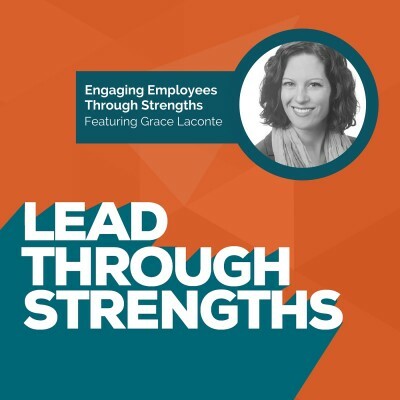 Grace Laconte joins us to help you lead through your strengths at work. You’ll find this episode especially useful if you manage a team or if you’re struggling to relate to colleagues. She also gives excellent insight into employee engagement. Know You’re In Your Strengths Zone. What it’s like when you feel the “high” of using your natural talents and getting a literal paycheck to show you that you’re moving in the right direction. When Your Strengths Are Opposite Of Someone Else’s. What to do when you have a talent of sparking ideas and projects, yet your constant ideas and activation of new projects drives your team crazy. In her case, she realized that her employees needed things she wouldn’t naturally bring. She gives great examples of how she listened deeply to understand what her employees needed. Notice Other People’s Strengths At Work. How to notice other people’s needs, even when you don’t consider yourself a great relator. Here are some ideas to spark your creativity. 1) Jon Hainstock at Zoomshift wrote a cool post with 51 Ideas for Employee Appreciation That Won’t Break The Bank. 2) We have a snazzy PDF available on our resource page that gives you 127 Ideas For Recognition. This one is especially helpful if you know you shouldn’t give a generic “good job” comment, yet you have trouble finding the words. Full Openness Between Employee And Manager. Whether it’s a good thing or a bad thing to talk about other job opportunities with your current employees. When People Are Grumbling About Work. How to consider what you could do differently on the team to impact this phenomenon. Lack of Engagement Driving Turnover. Grace shared her Top Five StrengthsFinder Talent Themes: Focus, Activator, Ideation, Input, Futuristic. If you want to explore your Clifton StrengthsFinder Talent Themes, you should check out the show called Theme Addicts. Grace is a co-host on that show. You can also find Grace on her company website, on Facebook, Twitter, and LinkedIn. Lisa Cummings: [00:00:06] You’re listening to Lead Through Strengths where you’ll learn to apply your greatest strengths at work. I’m your host, Lisa Cummings, and I’ve gotta tell you, whether you’re leading a team or leading yourself, it’s hard to find something more energizing and productive than using your natural talents every day at work. [00:00:24] Today, you’ll get a full perspective on conflict in the workplace and how to use a strengths-based approach to get harmony and effectiveness. Grace Laconte is lighting it up today from Vancouver, Washington. She is simply one of the best, you guys, when it comes to helping companies figure out why they’re experiencing employee turnover. [00:00:46] And on the personal side, I’ve gotta say, Grace loves music. We’ve been singing before pressing the record button. We’ve been singing some songs together so we’ll see if those bust out while we’re chatting. Grace Laconte: [00:01:02] Thank you. It’s great to be on the show. Lisa Cummings: [00:01:04] We’re going to talk about finding strengths, leveraging them, how to help managers do this. Not just to manage conflict, but to have better relationships, execute better, all kinds of things on tap today. Let’s get grounded in yours. Just thinking back over your career, what is a favorite peak experience you’ve had, where you felt really energized and at your best at work? Grace Laconte: [00:01:30] I became connected with a marketing consulting group that has helped me to understand how to market better. So my last few months have really blossomed and I’ve been commissioned and I’ve gotten some great opportunities to speak at organizations and associations around the country, in the winter and spring. [00:01:49] And so when I received the check in the mail, when I was paid for one of these, I was just jumping up and down. It was such a great experience because it finally crystallized that this was what I should do. This is taking all of my strengths and people recognized that I’m capable of doing it. It was a really peak experience. Lisa Cummings: [00:02:07] Yeah, that’s really cool. It’s like the reward moment where it call came together. Grace Laconte: [00:02:10] Finally! Yeah, it’s great too, finally. As an entrepreneur, you never know if what you do is going to pay off, but when that starts to happen it’s just such a great high. I love it. Lisa Cummings: [00:02:22] Very cool. High fives on the high. Yeah, that’s good. Grace Laconte: [00:02:24] Yeah, thank you. Lisa Cummings: [00:02:25] So, you guys can hear that Grace does this leadership development work through her practice at Laconte Consulting. So she is living strengths every day and it’s pretty cool because her work isn’t purely strengths work like mine is, yet she knows the value of it to the extent that she uses this in her consulting practice and I think that’s even cooler because that just shows that when you embed this into everyday life, it can have such a big impact on your business, and on your life. [00:02:59] Because you do StrengthsFinder, and this is something you’re totally into, tell everyone what your top five Talent Themes are. Grace Laconte: [00:03:07] Sure. Absolutely. My top Strengths is Focus, which is setting and achieving the goals. The second one is Activator, which is getting people enthusiastic about moving towards something. Third is Ideation, so coming up with popcorn of ideas and different, “If you don’t like that one I’ll come up with a new one.” And fourth is Input, so I gather and collect information and things that could be useful. And fifth is Futuristic, so I have a perspective on what could happen in the future to help guide the present. Lisa Cummings: [00:03:39] Hmm, I love your definitions, too. Those are some pretty good ones. What’s your favorite? Lisa Cummings: [00:04:08] Yeah, and now you’re creating all of this urgency because they see, “Oh, yeah. I can see doing what I’m doing is not going to land in a good spot.” Now, you’ve got me thinking about how managers also have this same situation where they need to consider their audience, their team members, just like you’re considering their perspective and figuring out how to reframe it. This is a challenge that managers tell me about all the time. [00:04:35] So, let’s say you’re my manager. I like a lot of consistency, I like to move slowly and make sure that things are correct and that should come above all things, but there’s change that needs to happen. So if that grates on you as my manager, you’re in great style, you have Activator, you have Ideation, this is popcorn, this is movement, that might grate on me as your team member because I think you’re bringing me new stuff all the time, new idea every three minutes. [00:05:09] And even if you’re on board with the change, how do you get your relationship and communication to work in a way that helps me get on board with the change? Grace Laconte: [00:05:21] It’s a great question. I have managed, in the past, people with Consistency and Deliberative, maybe not in the same person, but those strengths have definitely been high in the people I’ve managed. And what I’ve learned in my understanding of my own strengths was that, first of all, it takes a whole lot of people to make things happen. Just because I have Activator does not give me permission to pretend like I’m going to get it all done. In fact, I’m just the spark. [00:05:46] And I’ve learned this even in the last few months. But also it’s that strengths combination exists. What I’ve done in the past, as a manager and as a director, is to first start with my own perspective and recognize that I have a certain way of wanting things to move forward. I have expectations of how the future could look, then give my team some grace. That is my name, I’ll always remember to use it. Grace Laconte: [00:06:14] “Give me some slack here.” I’m also not very graceful, that’s kind of annoying. I trip all over the place. But my team members have talents and abilities and they’re able to accomplish many things. And a lot of times I made some missteps as a manager, too, in expecting things that were just not possible for them to do. So it took a lot of time and effort for me to really get to know my team members on a personal basis in terms of what they, not just enjoy doing, but what comes naturally. [00:06:46] And I do remember having conversations with a couple of people. One of them had Consistency. She was one of my health coordinators in a long-term care facility, and she was all over the whole process, “First I do this, then I do that. Every morning at 8:32 I do this. Every day I have to do these things in order.” That would be Achiever, I guess. But there was a pattern to how her unit worked. She was responsible for people within the unit. It kind of drove me nuts because I wanted to have, “Let’s try new things. Let’s shake it up.” She just couldn’t do that. She didn’t want to. [00:07:19] So we had a conversation about this. And I wasn’t trying to change her at all, but I wanted to understand, “What can I do to support you? How can your unit be more successful?” because I was responsible for five units. So she said, “I need to know that you’ll stand by me in order to get the things done in the order I need them done.” And that conversation really affected me. She needed me to support her and not to come in and tell her other managers in the unit that she was wrong. So that had happened to a previous manager. The employee had not been encouraged and held up with a lot of regard by other managers in the unit, so she had felt very alone and betrayed. [00:07:58] So that conversation helped me to realize that I need to support my employees even when I think that maybe they’re not going fast enough, because the need for consistency is actually more important to her than my need to activate action in order to get things done. And once I came to that realization it actually changed our relationship and she worked harder because she knew that I would not come around and embarrass her in front of her peers. It was really good. Lisa Cummings: [00:08:22] It must’ve gone a long way with her cared for and listened to. It also made me wonder, how did you see it? So as an Activator you’re probably a fast mover and lots of ideas and that sort of thing. When you come in, thinking, “Let’s shake it up. Let’s try something different.” How did you see it, that that conversation needed to happen that she doesn’t want to shake it up and you needed to look that as a little different? Grace Laconte: [00:08:48] Oh, man. Basically had a much better understanding of how it would be from their point of view rather than just me coming in like a tornado, “Hey, let’s try something, guys.” And in the past I had managed that way. It was a disaster. I came on way too strong and people did not expect, they did not want to move that fast, they didn’t see the point, and I ended up hurting some relationships because I didn’t take the time to really listen. Lisa Cummings: [00:09:14] It sounds as if it made you really think about what it means to lead a team, what it means to be a manager, and that you almost took on something of a servant leadership kind of philosophy where supporting them became your focus, and figuring how to get them what they need to do their job. Was that a conscious kind of view where you flipped the way you even looked at leadership and what the role of a manager is? Grace Laconte: [00:09:44] Yeah, definitely. I was in Minnesota at the time, and I think the real thing that changed was my managers were all very conscious of the needs of the patients. So I took that lesson with me to what I do now. Instead of focusing on my own needs and my own goals I really tried to listen to the needs of my clients and, especially, the client’s clients. [00:10:11] So the maturing of my understanding of strengths came when I had this wonderful lesson from my management team where I realized we serve patients first, we serve their needs, and everything we do should be about them. And, secondly, we serve our peers and our co-workers and everyone around us. They were the key to keeping the entire place running. We can’t forget about the people who do the work because they’re actually the glue that holds everything together. Lisa Cummings: [00:10:39] Yeah, that’s such a good insight as a leader to remember the end user, that if you’re not serving your employees they’re not going to serve your patients. It’s totally going to show up that you don’t respect them. In turn they’re not going to respect their customers and it flows all the way through. Grace Laconte: [00:10:55] Absolutely. I help organizations recognize that there are some root causes for staff turnover. Lisa Cummings: [00:11:02] Yeah, give us the magic. What are the things you find that cause it, the root cause? Grace Laconte: [00:11:06] Oh, my word. I’ve done a lot of research on this. First of all, healthcare has one of the highest injury rates of any industry. Any industry. More than construction. Grace Laconte: [00:11:18] Yes. So that was shocking to me. Lisa Cummings: [00:11:21] Does that end up affecting turnover, the injury rate? Grace Laconte: [00:11:23] Yeah, ongoing injuries can then affect that employee’s ability to get the next job, the employee’s performance can suffer in the next role, and to take time off after an injury can really affect morale. The longer an employee stays home, the less likely they’ll ever come back to work. So that employer is then saddled with massive costs for that employee’s medical care because of the injury. [00:11:48] I found two different research documents. One was about why they’re leaving, and the other is a survey of employers and what they’re doing to try to attract. And they could not have made more diametrically different. The reasons that employers are trying to get people to stay would be more money, they’re not resisting that, right? More money, more benefits, maybe more time off, maybe physically experiences, you know, their top level management walking around. That doesn’t really make a difference. It sounds great on paper but it’s not what they need. The primary reasons for leaving a job have nothing to do with money at all. Shocking, right? Lisa Cummings: [00:12:25] Well, what are they? Grace Laconte: [00:12:26] They leave because the ability to interact with their team members and the way it made a difference. The ability to say something that would actually be taken seriously and acted upon. They leave because they don’t feel wanted in the organization, they don’t feel appreciated for their work. The reason they’re leaving is for strengths-based reasons, if you think about it. If they contribute their ideas and those were actually acted upon, if their team was unified and they understood each other’s strengths better, it’s much better likely they would actually stay employed and be very happy to serve even more than what they do now. Lisa Cummings: [00:13:00] Yeah, and I don’t think that healthcare facilities are alone. This is the same kind of stuff I’ve heard in the HR field for years. Grace Laconte: [00:13:09] Yeah, and that goes along, I’m sorry, but it goes along with the percentage of dissatisfied employees who across the U.S.
Lisa Cummings: [00:13:15] Oh, yeah. Grace Laconte: [00:13:16] Or it was the two-thirds of all U.S. workers are unhappy right now. Lisa Cummings: [00:13:20] Exactly. And, globally, it’s worse. It’s only 13% fully engaged. I mean, 87% not. So you mentioned appreciation and feeling like their work matters or feeling like they’re cared for work. Give the managers, who are listening, some tips. And I really think this applied to anybody who wants to spot a strength in action and appreciate others, just a great human action to do. Help people think about how to spot the stuff in action. Moving crazy, your day is hectic, what could they be noticing and appreciating that they’re not? Grace Laconte: [00:14:03] What I really struggle with is to see the relationship needs of people in my team. So I’ve had to make up some processes to help me. Grace Laconte: [00:14:22] I mean, any manager can have any combination of strengths obviously, but a lot of managers who have Strategic-thinking strengths tend to have a really hard time relating to their employees. So I do, too. I have a hard time relating to them, so I have to work really hard at it. So one way that I’ve kind of made a cheat sheet for myself is, first of all, notice what frustrates people. [00:15:13] So, one thing is, first of all, to notice when people are unhappy. And if you’re not noticing that, or you try to brush it under the rug, I guarantee it will not go well in the future. It will get worse. So whether that people are griping about, whether they’re muttering under their breath, when they have a bad attitude, just assume, as a manager, it has something to do with how you’re managing. [00:15:32] If people are unhappy in your department, there may be something that you’re doing, as a manager, that’s not helping them to fulfill their own ability, and that could mean that you could adjust things so that they have a better ability to shine, or it could be that they just are not the right fit for the team. Either way, asking questions will help to clarify this. [00:15:51] I actually had an employee who was very unhappy with how I ran the department, and I had a lot of conversations with her about how I could adjust things. But at the end of the day we needed to have results. And she was very unhappy to create the results. She didn’t want to do the tasks that were assigned. She’s been at this stuff for years and years but no one had ever held her to the fire to actually get results. [00:16:12] And so everyone else they’re fulfilling what the tasks are every single day that we’ll get them to the results every month, and I need the report back every month that were done these things. We haven’t missed deadlines, we’ve gotten the reports done that we needed, and she just didn’t like it. So I had some pretty frank conversations with her about her need to have inconsistency and how that wasn’t going to fit our department needs. [00:16:35] It actually helped her to talk. This sounds terrible. But I talked her through whether this was the right role for her, and she agreed that it was not so she gave her notice. And my boss congratulated me, “Thank you so much. We’ve been trying to get her to quit for years. You finally said the right thing.” I wasn’t trying to get her to quit. I was trying to help her understand that her abilities and her interests were not in line with our department once we had the conversation. Grace Laconte: [00:17:26] Is that the worst thing? Lisa Cummings: [00:17:27] And I go, “That is a good thing.” Right, if you can have an open conversation with them, I think most teams I’ve ever been leading, somebody could come to me and say, “I’m considering another role.” And you can say, “Tell me more about it.” Sometimes it’s because, “Oh, I can get $10,000 more a year.” So they give you lots of different reasons. But then when you open the conversation then you get to say, “Well, let’s talk about it. I want the best for you. So that might be here, that might be somewhere else.” But just opening that conversation to what is the best fit is best for everybody. Grace Laconte: [00:18:07] It helps them too. I think sometimes, as managers, we have a guilt complex. We don’t have to make them happy. We just have to bring out their strengths. And when you do that it might mean that they are not well-suited for their role, or the changes that happened in the organization may not make them the right fit now. They may have been a year ago, but things have changed. Grace Laconte: [00:18:47] But it is. It’s refreshing to just put it out there. Talk about the elephant in the room, you know. And, in love, you have to do it from the perspective of caring enough to really care about what they want. But when you have that conversation it can just really be inspiring. It can be a good result if they leave, as long as it’s from a place where you care about them. Lisa Cummings: [00:19:09] I think that’s such a good place, such a good note of love to end on. Grace Laconte: [00:19:14] Love. Love. Lisa Cummings: [00:19:15] That you don’t have to come from the perspective of making them happy but if you’re coming from the perspective of helping them lead through their strengths, you know you’ve done the right thing. It’s such a great note. It’s been so good. [00:19:28] So, now, the listeners are going to want more of you. How do they find you, Grace? Grace Laconte: [00:19:33] Well, you can reach me at my website LaconteConsulting.com. I have my email address there, my phone number. Give me a call. Seriously, give me a call. We can talk. If you just want some encouragement because you’re struggling, I absolutely love to talk to struggling managers. Those are some of my favorite peeps, struggling managers, because I’ve been there so many times. [00:19:56] You can also find me on Twitter @LaconteStrategy and then Facebook page, I’ve got a Pinterest page, I’ve got a lot of other places, but go to my website. You can find all of those links. Lisa Cummings: [00:20:08] Wonderful. I know they’ll be tracking you down. And if you want to hear her, like we have here, she’s also on the THEME-ADDICTS podcast. I’m sure, listeners, you might be one of those people like me who is constantly discovering new ones to listen to, so add that one to the list. Grace Laconte: [00:20:25] Yes, we really have so much fun. Lisa Cummings: [00:20:27] So, thank you, Grace, for joining. And thank you, everyone, for listening to Lead Through Strengths. Remember, using your strengths makes you a stronger performer at work. If you’re always focused on fixing your weaknesses, you’re choosing the path of most resistance. So claim your talents and share them with the world.